MANGOCHI, Malawi - From the 20th to the 25th day of January 2019, the members of the Africa Anglophone delegation living and serving in Malawi were united at Montfort house Namiasi, in Mangochi for their annual retreat. It was a time of intense prayer and reflection that was directed by His Lordship George Tambala OCD, the Bishop of Zomba Diocese in Malawi. The retreat started off on Sunday evening with the arrival of the members from different communities. The members were warmly welcomed by Fr. Charlie Bernie and Br. Henry Chagoma who are members of the Namiasi community. After which was the arrival of the bishop. At the start of the retreat, the Bishop thanked the Montfort missionaries for their work and sacrifices in Zomba Diocese. He chose the theme “The Road to Emmaus”, which was taken from the famous episode of Jesus’ encounter with the two disciples on the road to Emmaus in the Gospel of Luke 24:13-39. Like the two disciples, he then asked the retreatants to be mindful and passionate within their hearts each time they have an encounter with the Lord. The general mood of the retreat was quiet as there was a lot to reflect on. The facilitator not only focused on the gospel but also drew an insight from his two books on religious life (History of Religious Life in Africa: Shift of Paradigm and Prophetic African Religious Life in the 21st Century). He also offered a copy of each book to all the members present. 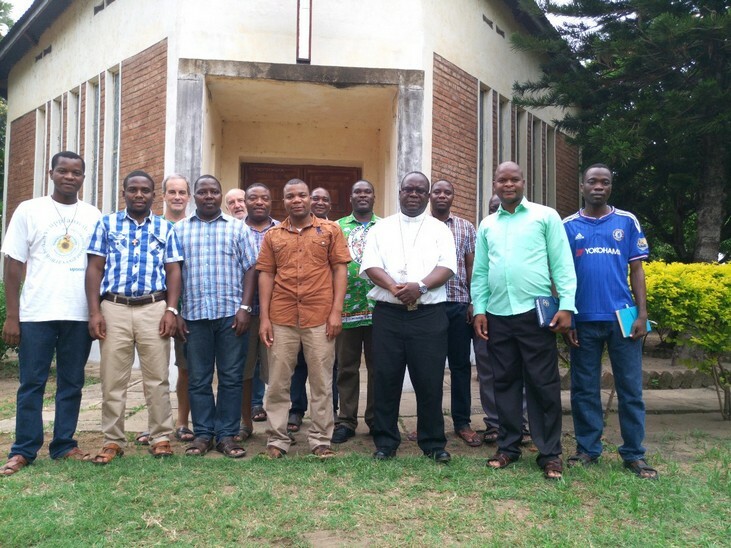 A key among the issues was the new face of religious life that is emerging across Africa and the rest of the world. He pointed out how religious life is undergoing “mutation” and that it is going at a fast rate due to the changes in this world. The facilitator, among other things, emphasized that the religious life of the future has to return to its original inspiration and take on a new controversial praxis as well as to the new ways of community life and mystical dimension. At the end of the retreat, Fr. Samuel Satiele, who was representing the members present, expressed his gratitude to the Bishop for his humility in accepting the invitation to facilitate our annual retreat. He went on to thank him for the two books that he generously gave to each member. He also thanked the Bishop for pointing out the challenges the religious life is facing today and how to respond to them. Furthermore, he also showed his appreciation to Fr. Felix Phiri (in absentia) for his courage to invite the Bishop for this meaningful gathering. Finally, the retreat ended with a group photo with the Bishop and the members present.